More information, please refer to our website battery-adpater.com. 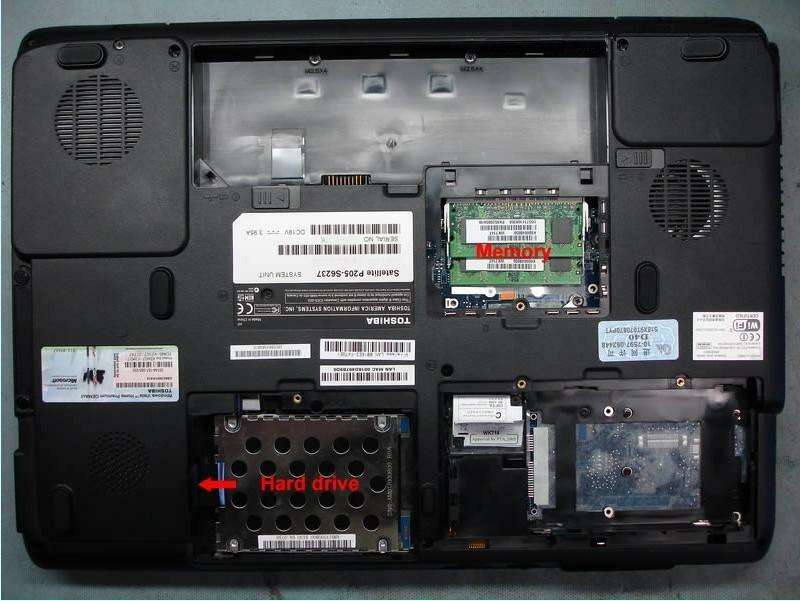 The acutal laptop in this guide is a Toshiba Satellite P205. 1. 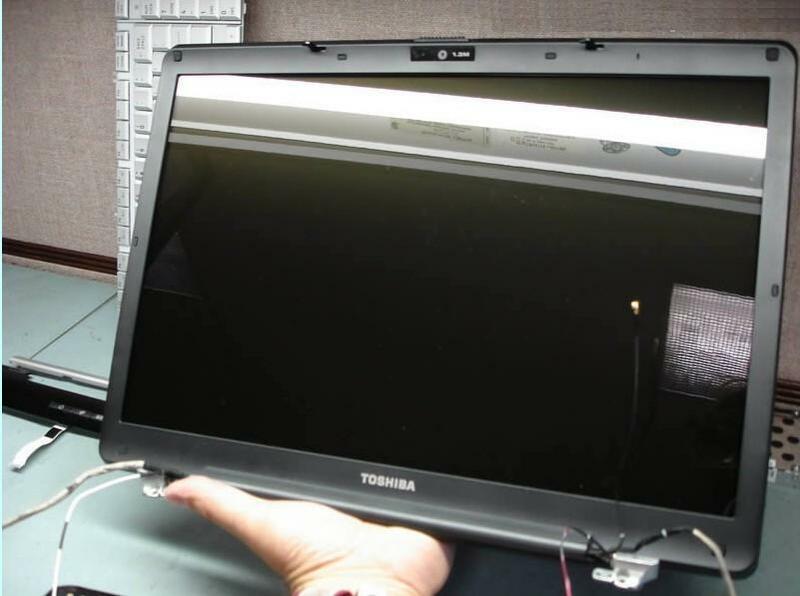 Turn off you Toshiba Satellite P200 / P205 / X205. Disconnect the power adapter. Remove the battery. 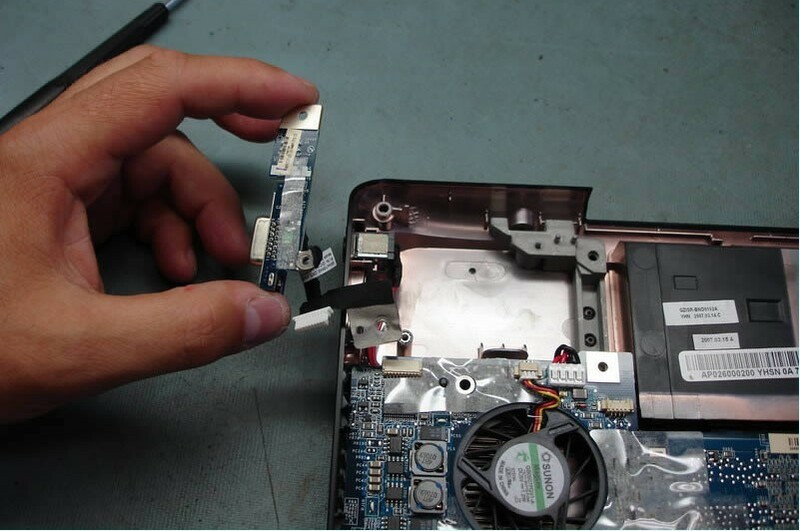 Remove memory cover, hard drive cover and modem cover. Each cover is secured by one screw. 2. 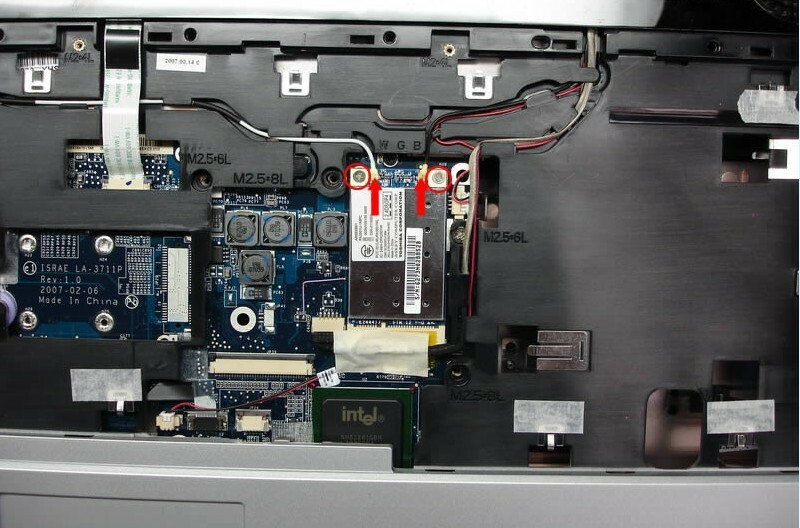 Slide the hard drive to the left side to disconnect it from the motherboard. 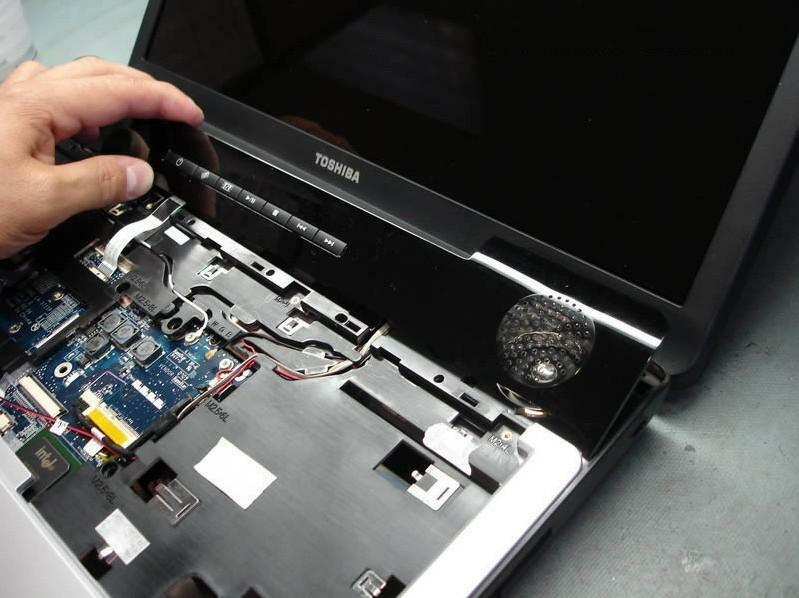 Carefully lift up the hard dive and remove it from the laptop. 3. 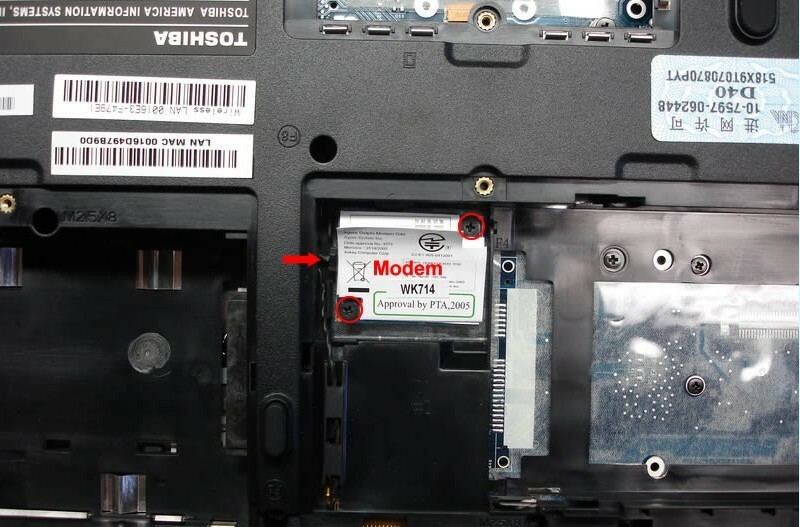 Remove both screws securing the modem card. Carefully lift up the modem. The modem is connected to the motherboard. This connection is located under the modem so you cannot see it. Unplug the modem cable. 4. 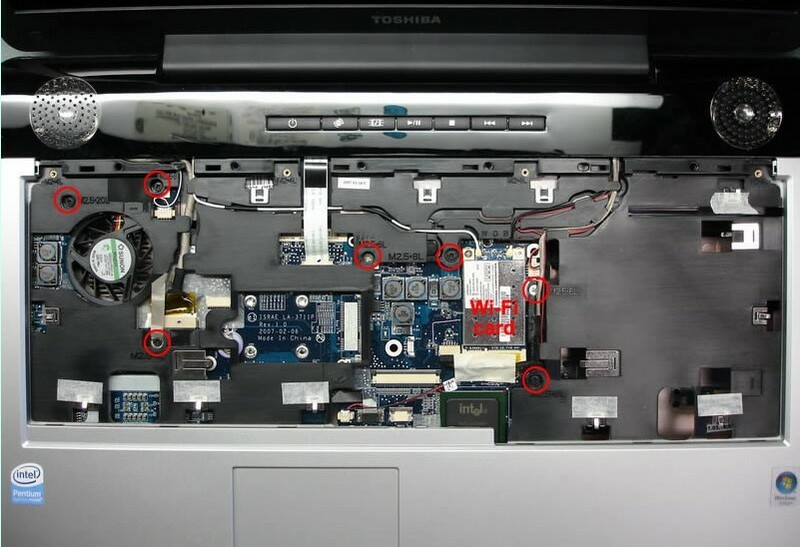 Remove one screw securing the DVD drive to the laptop case. 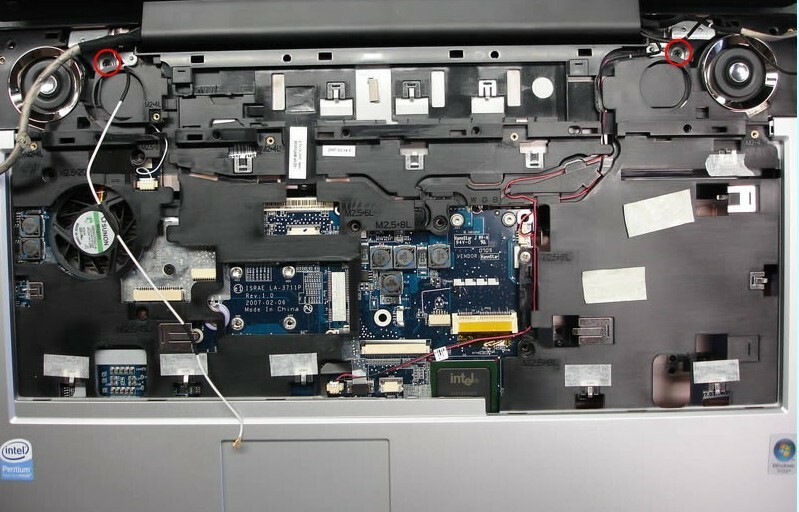 Remove two screw seals. 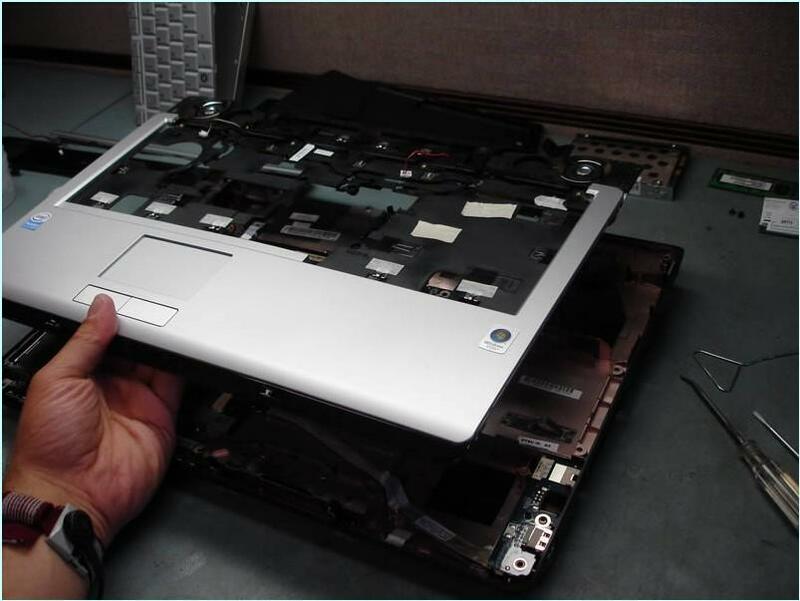 Push the DVD drive with a screwdriver and remove it from the notebook. 5. 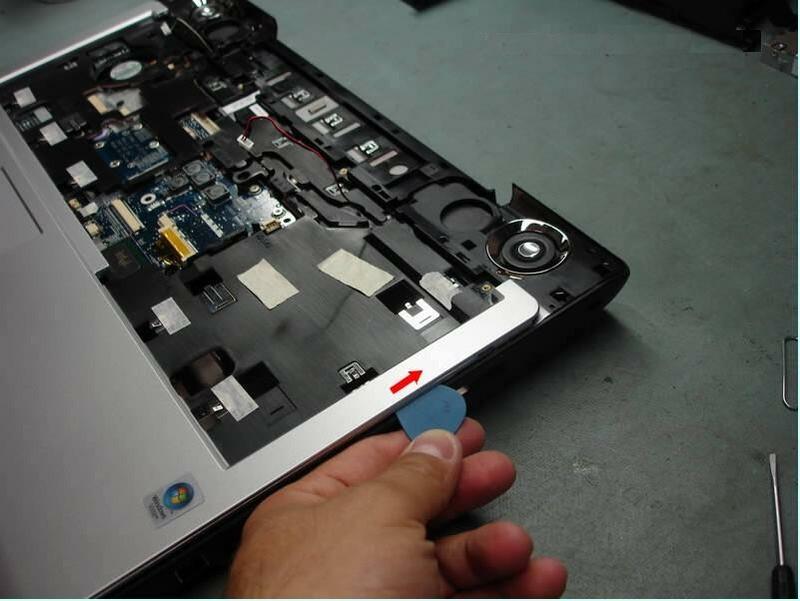 Remove all screws marked with red circle. In the previous step you removed two screw seals. 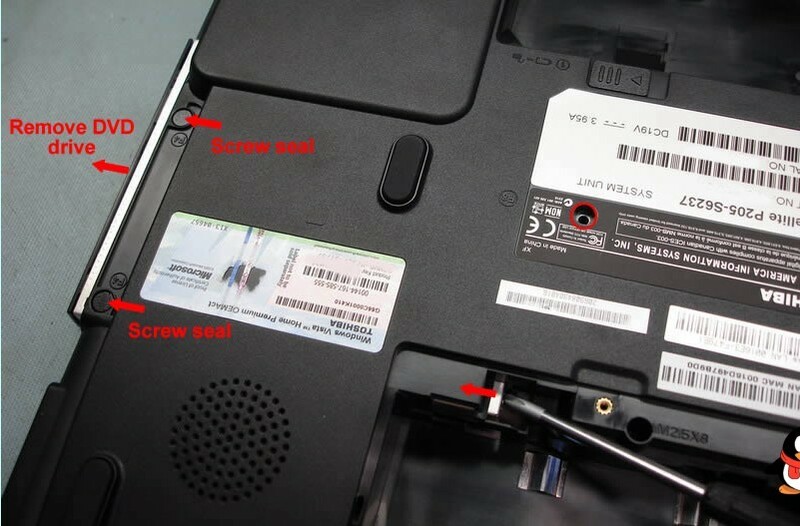 There are two screws located under the seals and you can access these screws only after the DVD drive is removed. 6. Remove two screws from the back side of the notebook. These screws securing hinges. 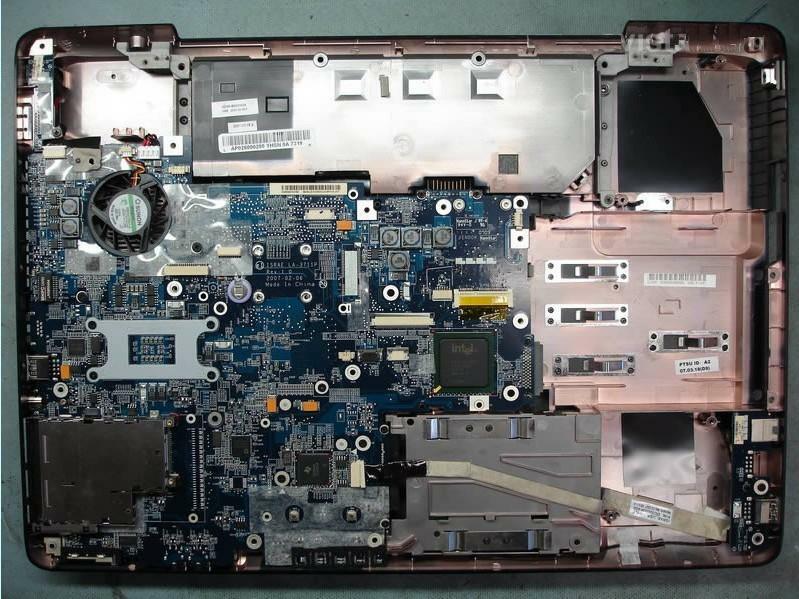 Turn the laptop over and start removing the Toshiba Satellite P200 / P205 / X205 keyboard bezel and the keyboard. 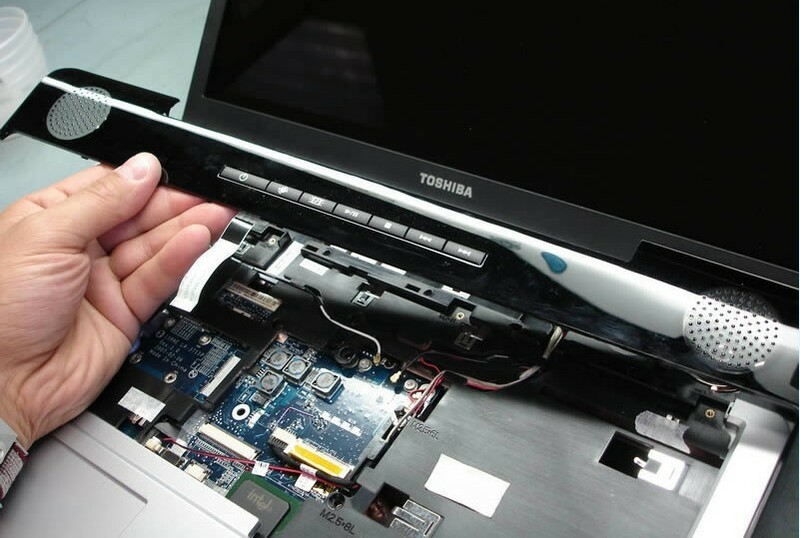 You can refer to the other instruction How to Replace Toshiba Satellite P205 / X205 Keyboard. 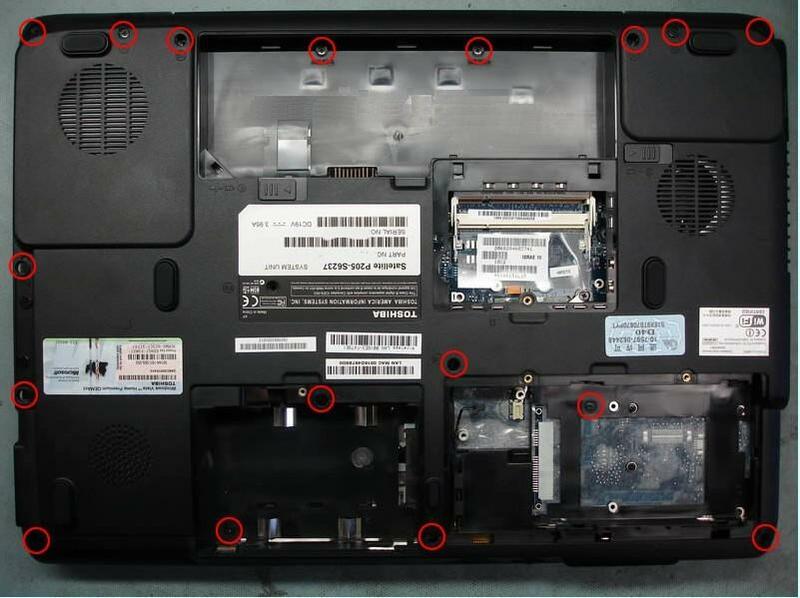 7.In order to split the notebook case, you'll have to remove all marked screws located under the keyboard. 8. Unplug both wireless card antenna cables. 9. Disconnect the switch board cable from the motherboard. 10. Start separating the speaker cover from the notebook. 11. 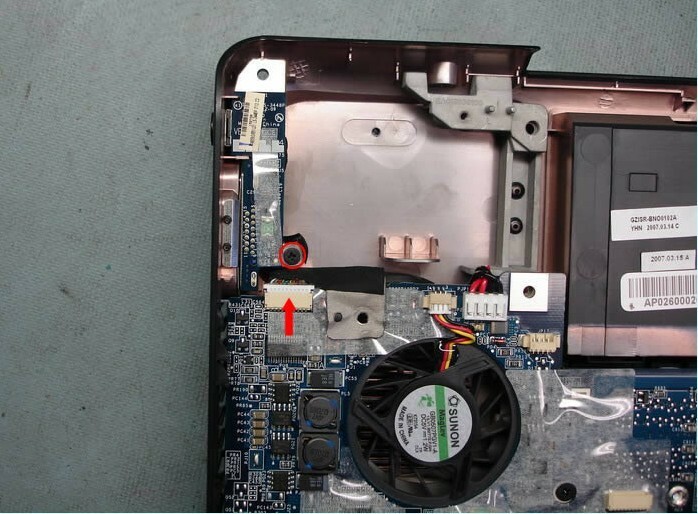 After all latches are released, lift up the back side of the speaker cover. 12. Remove the speaker cover. 13. 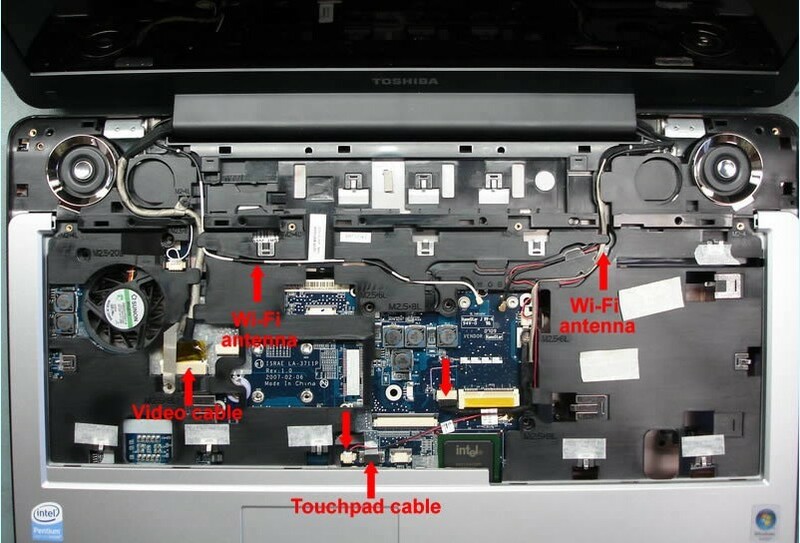 Unplug the video cable, the touchpad cable and other small connectors. 14. 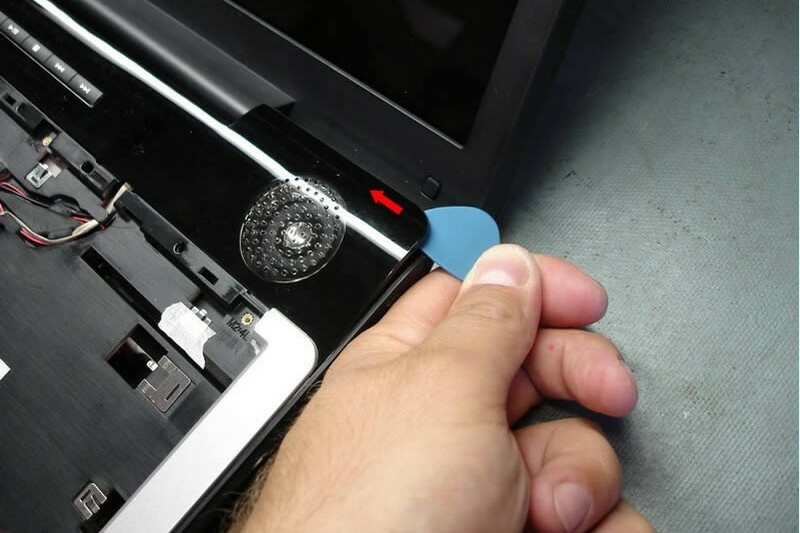 Remove two screws securing the display assembly hinges. 15. 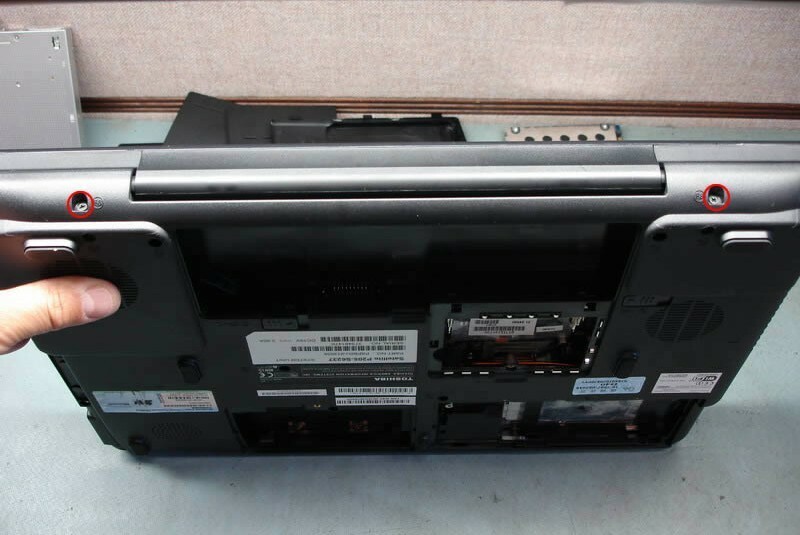 Lift up and remove the display assembly. 16. Start separating the top cover assembly from the notebook base by moving the guitar pick alone the side. 17. 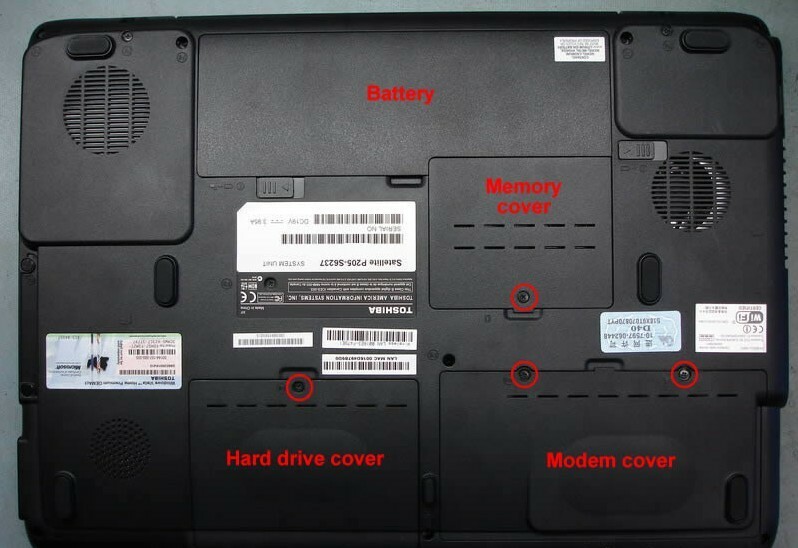 Remove the top cover assembly. 18. Now you can access the motherboard. 19. 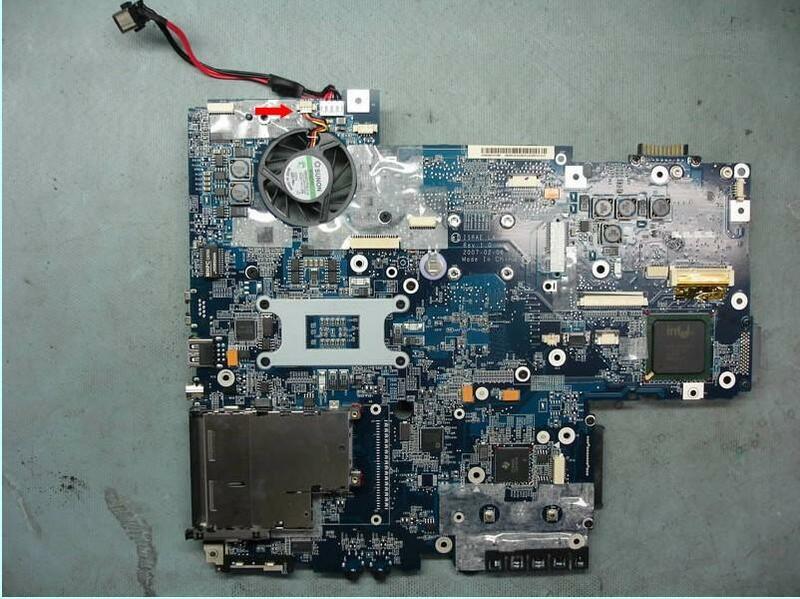 In order to remove the motherboard, you'll have to remove the VGA connector board first. 20. 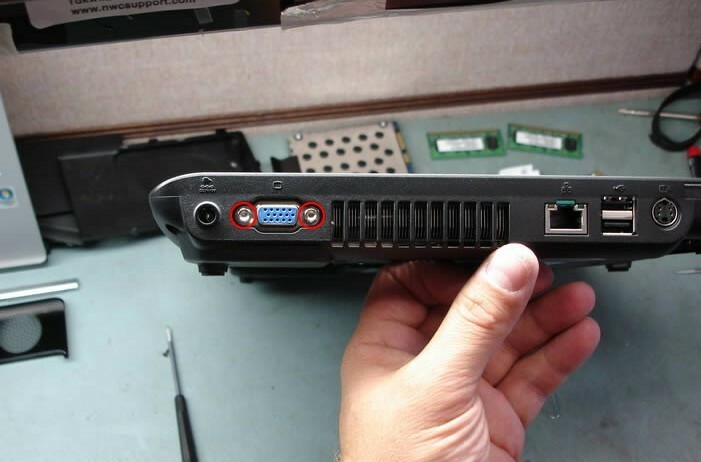 Remove two hex studs from the VGA port on the left side of the notebook. 21. 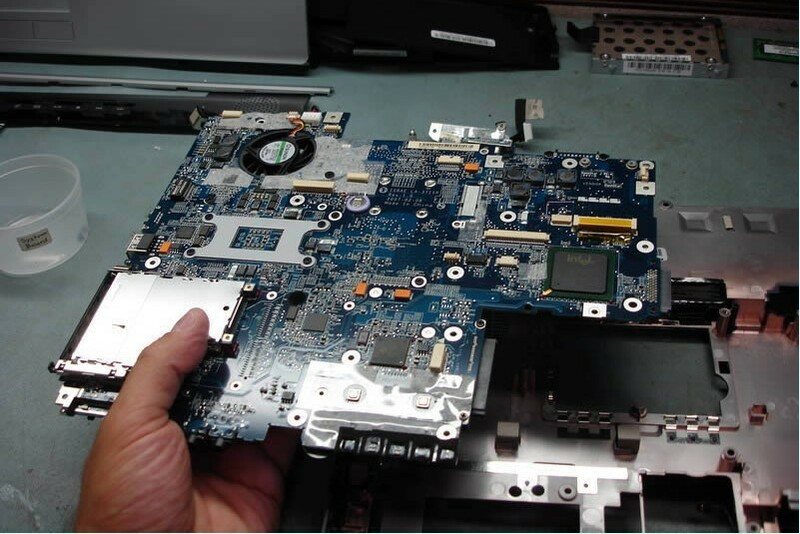 Remove the VGA connector board. 22. Unplug the USB board cable. 23. 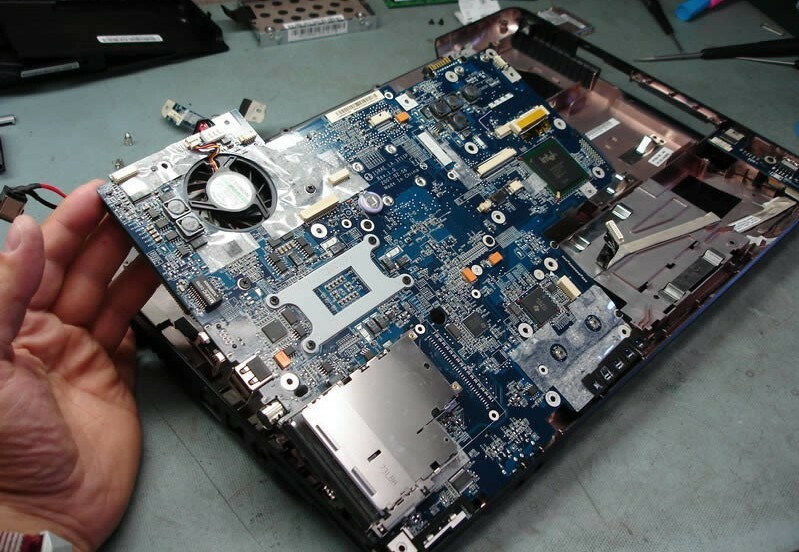 Start remving the motherboard from the notebook case. 24. 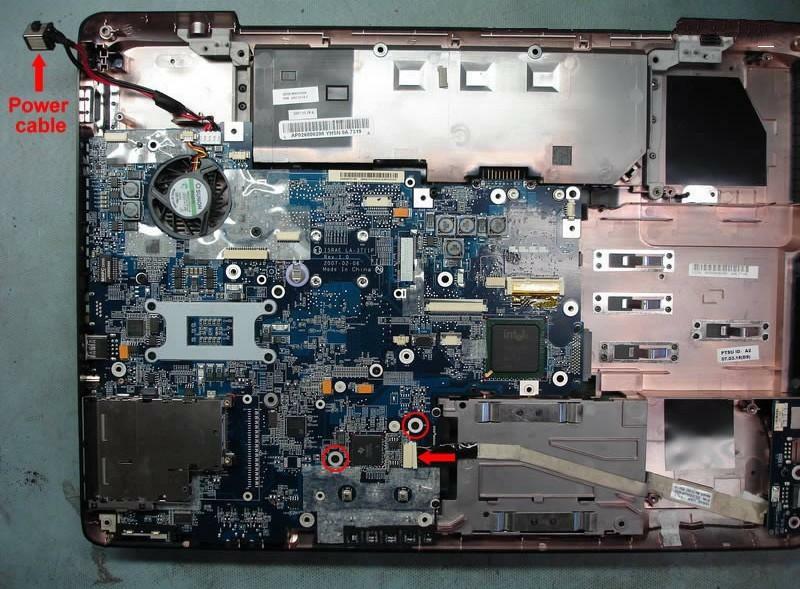 Lift up and remove the motherboard. 25. 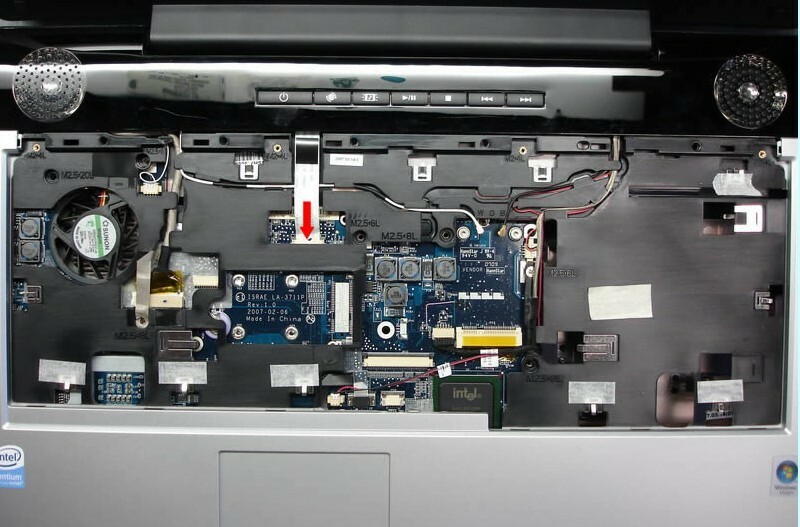 Unplug the cooling fan cable and turn the motherboard over. 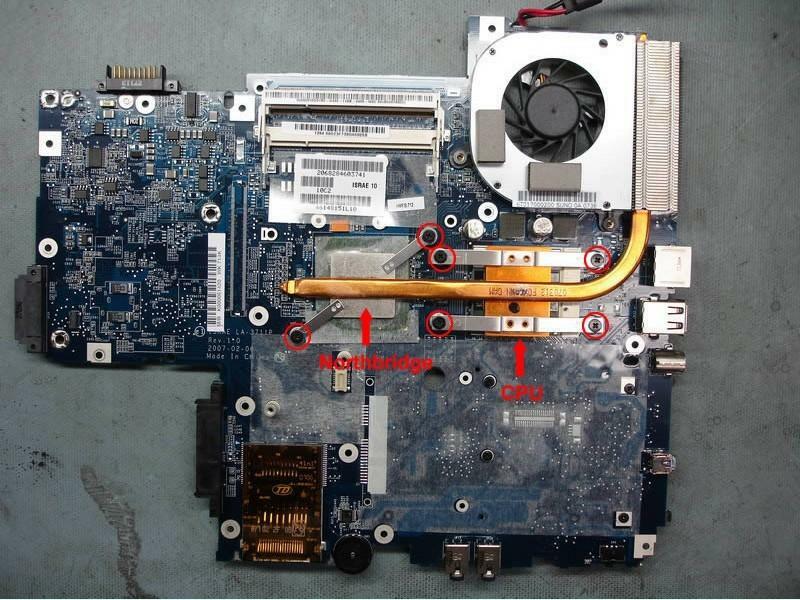 26.Now you can remove six screws from the heatsink, remove the heatsink and the cooling fan. 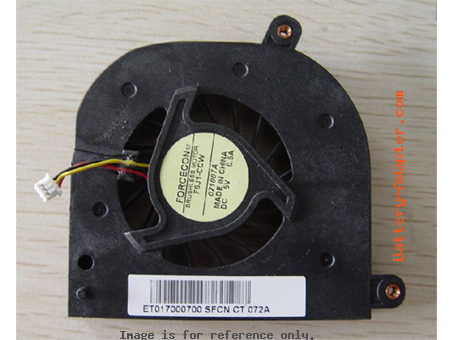 In the most of case, you only need to replace the fan. You can find a Toshiba Satellite P200 / P205 / X205 Fan here. 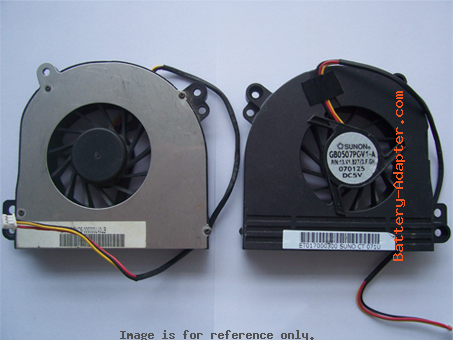 Notice: There are two different fans for the laptop, please verify which one is the same with your original one.